FILE - Israeli soldiers stand guard next to cameras at their new position in front of a Hezbollah flag, near the Lebanese southern border village of Mays al-Jabal, Lebanon, Dec. 13, 2018. 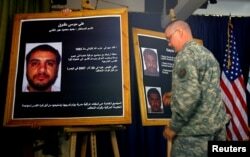 FILE - A U.S. soldier shows a picture of Ali Musa Daqduq during a news conference at the heavily fortified Green Zone area in Baghdad, July 2, 2007. 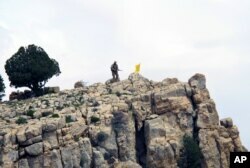 FILE - A Hezbollah fighter stands on a hill next to the group's yellow flag in the fields of Assal al-Ward, Syria, May 9, 2015.